Reliable Touch-Free Luxury Foam Dispensers, 6.375" W x 11.25" H x 4.438" D, Light Gray, Capacity: 1200 ml (12/Ctn) Touch-free, trouble free dispensing system. 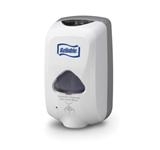 Automatically dispenses the perfect amount of foam soap needed for hand washing in one shot. Dispenser features a skylight with an extra-large site window that makes it easy to see when it’s time to reload. Fully ADA compliant. For use with Reliable Touch-Free Luxury Foam Handwash products.